This year's batch of hand embroidered wool stars made with rescued materials. 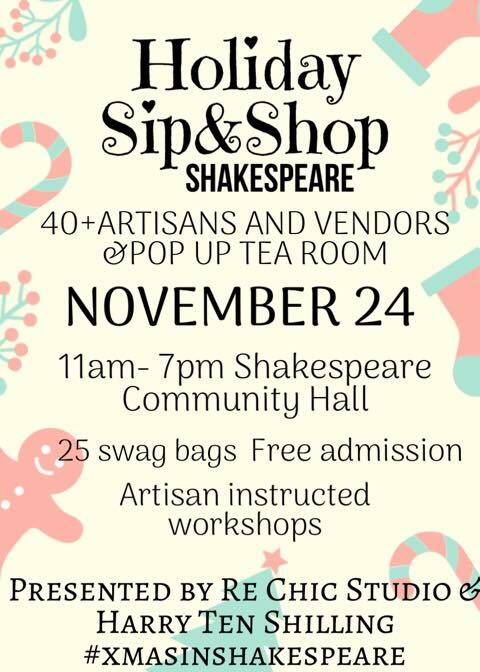 It's holiday sales season and I am gearing up for the Shakespeare Sip & Shop tomorrow! Before I share the details, I wanted to give you some motivation for choosing to distribute your hard earned dollars in your own community this year. Every time you purchase a gift this holiday, your money will support and reinforce a method of making, distributing and purchasing a product. If you buy from a chain store or online retailer, not only are you essentially voting for the continuation of that system, but most if not all of your money will be leaving the community in which you live. Not to mention the environmental impact of manufacturing, shipping, storing, and packaging. 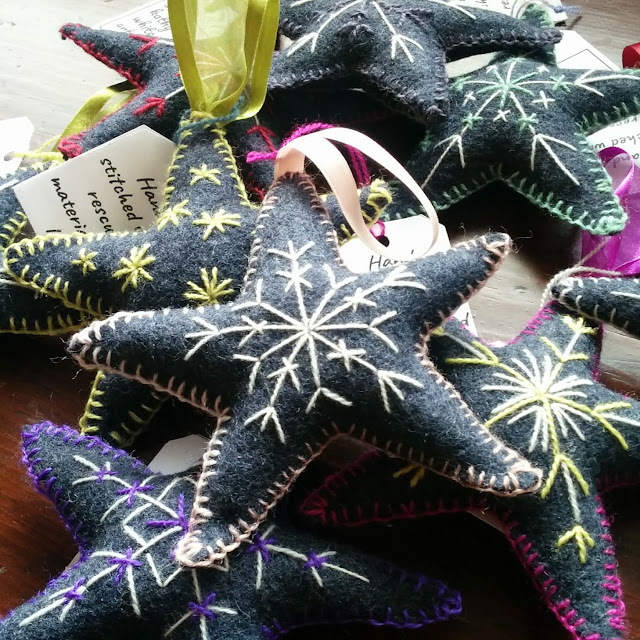 When you purchase an item that has been locally handmade, you are directly supporting a member of your community and your money stays in circulation in your own area. Many makers are also eco-conscious and their products are healthier for you and the planet. And the gifts you give will be truly one of a kind treasures. This holiday season, vote to support the creative members of your own home town and buy locally handmade! My holiday sales season kicks off tomorrow at the Shakespeare Sip & Shop. As happy as I am to be a first time vendor at the show, I can't wait to try some of Harry Ten Shilling's tea and scones! Mmmm. Free admission, free parking, and free swag bags for 25 lucky people. See you there? Next weekend, I'll be in the Blyth Memorial Community Hall for the indoor Artisan Night Market on Friday November 30th, 6 - 11 pm. I'll be there again on Saturday, Dec 1 & Sunday, Dec 2 for FACTS' Holiday Handcrafting Weekend - free community craft activities, demonstrations and sales on Saturday and a fabulous workshop on Sunday that lets you do the making! More info here. Finally, I am returning to the fascinating Factory 163 in Stratford, ON for the St(Art) the Holidays Art Show & Sale on December 8th & 9th. Last year's show was a tremendous success and, more importantly, a lot of fun. Live music, fabulous coffee by Revel, a wine bar, and amazing, original arts and crafts. Definitely worth marking on your calendar! Where ever you live, please think about the kind of world you're supporting when you make your holiday purchases this year and see if you can send a little love and support to your local makers. Your own world will be better for it! I am proud to announce that my work and yarn painting kits are now available through the Textile Museum of Canada! It makes me happy to include Briggs & Little wools in my artwork. They are the oldest woolen mill in Canada, they use 100% Canadian wool and their colours are rich and evocative. Copyright 2016 - Katherine White. Picture Window theme. Powered by Blogger.